Looking to swap your gold? You've come to the right place. Enter an amount you'd like to swap in one of the boxes below, and it'll give you a conversion to another type. Please enter a gold amount to see the conversion rate. If you're happy with the prices you see, contact us in live chat to arrange a swap. RuneScape Gold swapping is a cinch when you use RSGoldFund. Simply enter an amount of gold you’d like to convert to another type of gold in the field below, and we will automatically quote you with the amount of gold we can swap based on our conversion rate. If you have any questions regarding how to use this feature, or any questions regarding our exchange rates, simply open up a live chat with us and we will be happy to walk you through the process of swapping RS gold on our site. Players looking to swap their OSRS 2007 gold to RS3 gold, you’re in the right place! Simply use our currency converter below to get started and start swapping! 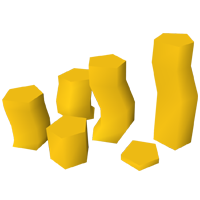 Currently our site is setup for you to swap 2007 RS gold, DeadMan Mode gold, and RS3 gold. Gold swapping is not a one way street here at RSGoldFund - you can swap from 07 gold to RS3 gold or vice versa, as often as you need to right here on our RS Gold swapping page. Like any currency, RS gold is prone to market fluctuations that impact the price. Simply use our easy gold swap calculator below to see what our current exchange rate is. This tool will automatically help you find out the RS3 to OSRS exchange rate that we are currently offering, and can be used to determine many other exchange rates as well. We are confident that when you compare our RS gold swapping exchange rates to our competitors, you’ll know why the majority of RS gold swappers choose RSGoldfund for all of their gold swapping needs. RS swapping is a great way to take your currency with you from one RuneScape version to another. We offer this RS swapping service in one of many efforts to be your one stop source for all of your RuneScape gold needs!